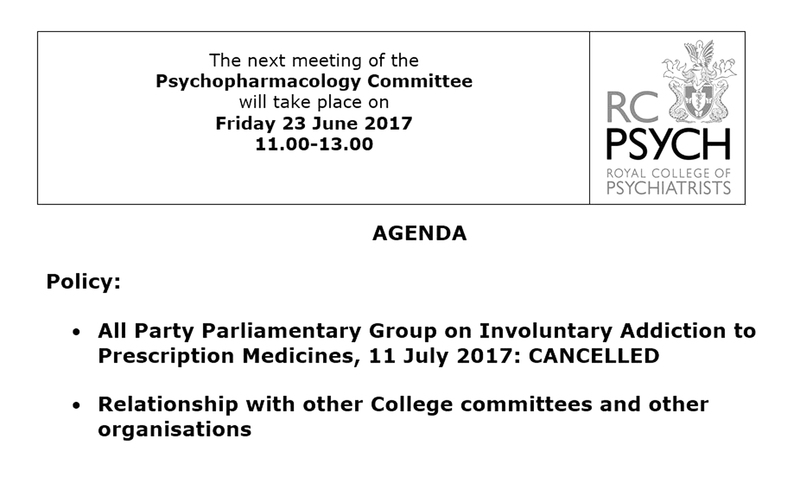 The June 2017 Agenda of the Royal College of Psychiatrists Psychopharmacology Committee confirms that a discussion on ‘involuntary addiction to prescription medications’ was scheduled. My view is that such discussions should be fully recorded and shared with the public. It is the case that a significant number of the members of this Committee have competing financial interests though the potential scale of this cannot be fully evidenced as such financial interests do not have to be specifically declared. It is also the case that a significant number of the members of this Committee are members of the British Association of Psychopharmacology (BAP) which is one of the main contributors to continuing medical education in British psychiatry. Some of the competing financial interests of BAP educators can be found here. “I am writing to express concern about the level of competing financial interests in the overall membership of the RCPsych Psychopharmacology Committee. Evidence has demonstrated that such financial competing interests can lead to doctors recommending worse treatments for patients. I am also concerned about the close working relationship between RCPsych and the British Association for Psychopharmacology (BAP) in terms of educating UK psychiatrists and trainees. This is for the same evidence-based reasons as above. I am confused by the agenda item. The APPGITA no longer exists. We now have an APPG on prescribed drug dependence. It is drug dependence, not addiction, involuntary or otherwise. But we agree the public need to know what is discussed. It is the health of patients that is destroyed after all and we need something to be done about this ever present and growing problem.